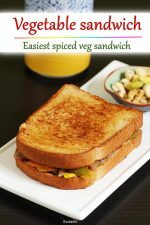 Veg sandwich recipe – A simple mixed vegetable sandwich for breakfast or evening snack under 15 mins. 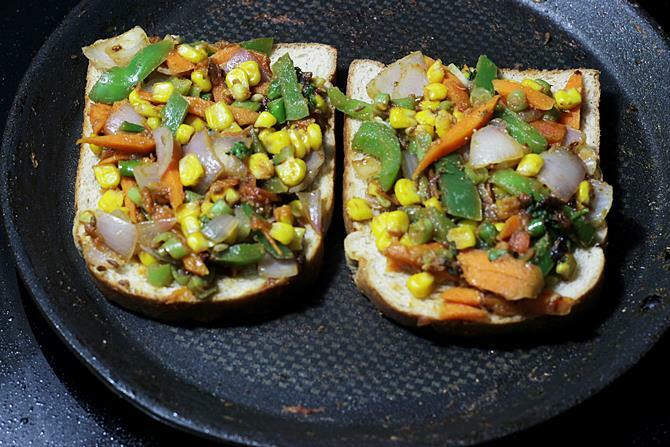 This veg sandwich is so delicious, sort of healthy & is devoid of sauces, chutney or cheese. Most sandwich recipes call for some or the other sauces, spreads or cheese. 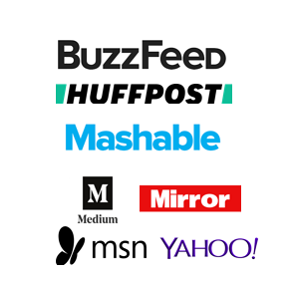 I do not stock up on any bottled spreads or sauces as most of these come with loads of creepy ingredients & additives to extend the shelf life. It is hard for me to make any sandwich that has these ingredients listed as I never have them in hand. Whenever my people at home ask me for a good sandwich this is something that comes to my mind instantly. This veg sandwich recipe is made without a grill, toaster or oven. 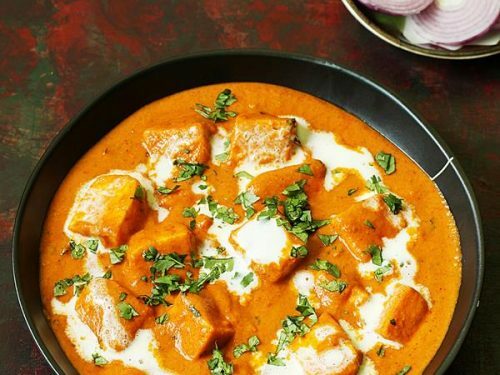 It is just made on a pan/ tawa or griddle in the simplest way. I have not used any sauce or green chutney. 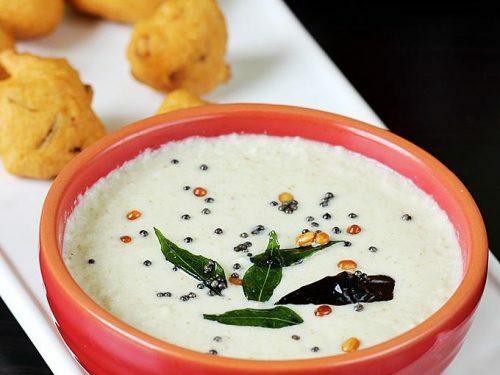 So it is good even to make on a busy weekday morning for breakfast as it needs only a handful of ingredients that we mostly have in the pantry. I have used carrots, onions, corn, beans & bell pepper. 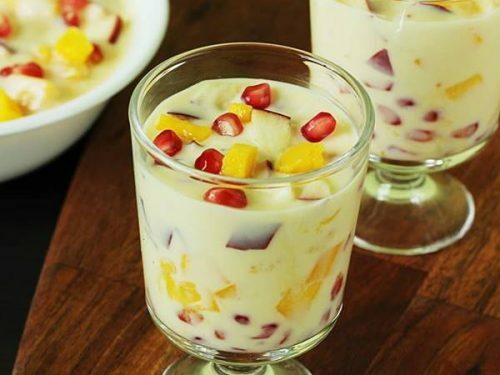 You can also use some boiled potatoes, sliced or grated cheese if you like. 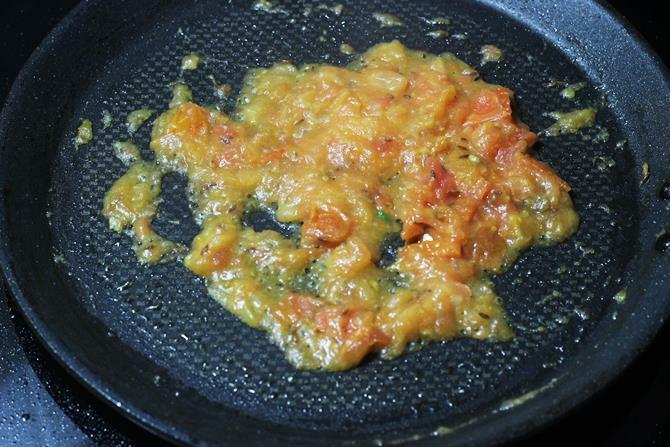 Tomato is used for binding the veggies, if skipped the mixture may turn dry. To bind the veggies, you will need to either use cheese or grill it in a sandwich maker. 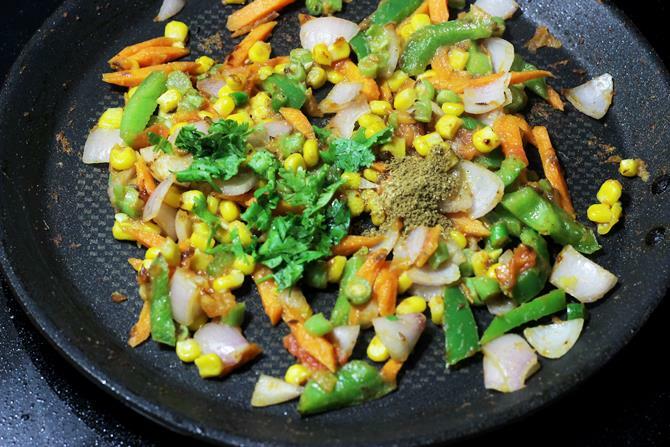 You can use any quick cook mix vegetables of your choice. This veg sandwich can also be made with a single veggie like carrot or bell pepper or sweet corn alone. You can also use the prechopped mix veggies from the frozen section. 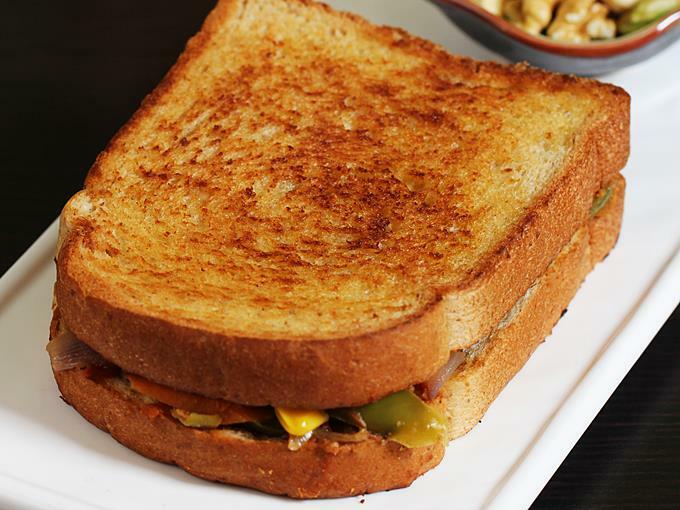 Feel free to use any cheese of your choice to make a cheese veggie sandwich. 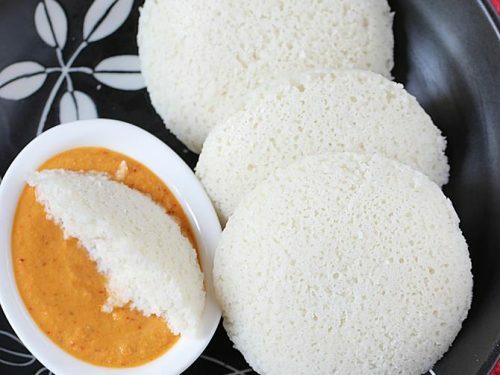 I sometimes use the mozzarella cheese or paneer in this. 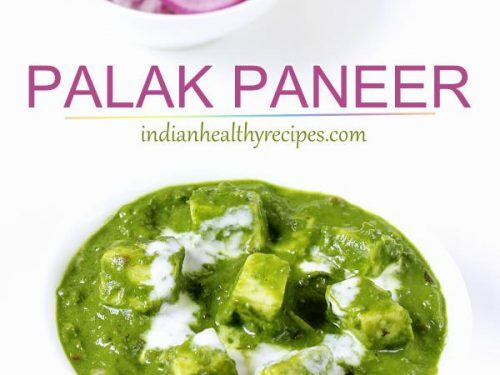 You can also use any chutney like this green chutney if you have in hand. Just spread it over the bread and then add the sauteed vegetables. For healthier option make the veg sandwich with brown bread or whole grain bread. You can also make this in a sandwich toaster. Easy vegetable sandwich made on stove top in a pan. 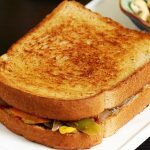 This veg sandwich recipe is super quick to make even by a newbie as it only needs basic ingredients. These vegetable sandwiches can be enjoyed for breakfast or snack. 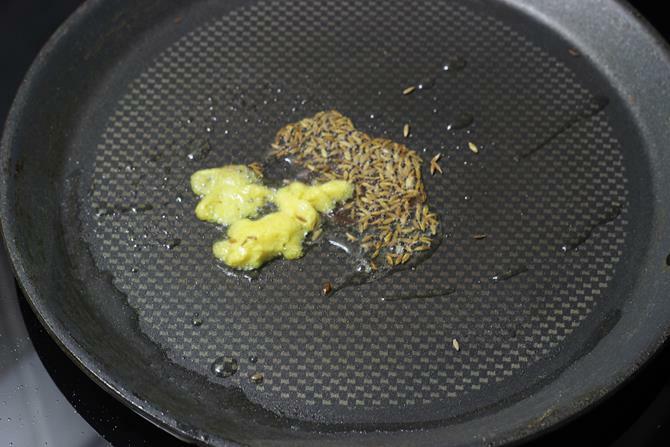 Add oil to the pan, add cumin and allow to splutter. Saute garlic until a nice aroma comes. Next add tomatoes and sprinkle salt. Cover and cook until soft and mushy. If using red chili powder add it now and saute for a minute. 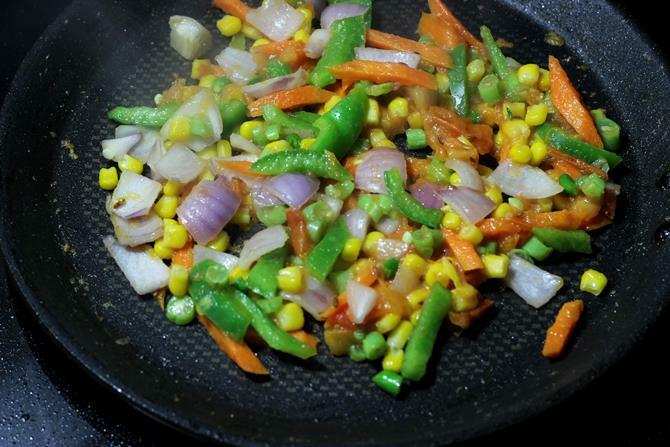 Add the veggies and begin to saute on a medium to high flame until half done or soft cooked to suit your taste. You can also cover and cook until soft. Next add masala powder and coriander leaves. Stir and saute for a minute. If needed add more salt. Set this aside. For stove top grilling – Smear butter over the bread slices and toast them until golden on the outer side and until crisp on the inner side. Transfer the prepared veggies. If desired add cheese at this step. 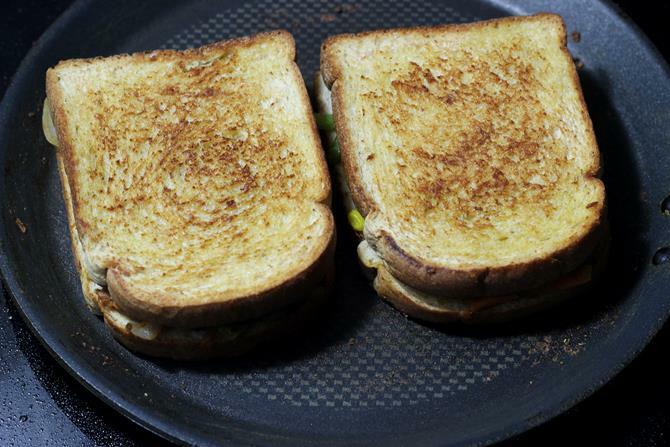 For grilling in veg sandwich in toaster – Butter the bread slices on the outer side. On the inner side spread the veggie mix and cover with another slice. Grill it in a sandwich toaster until golden. 1. 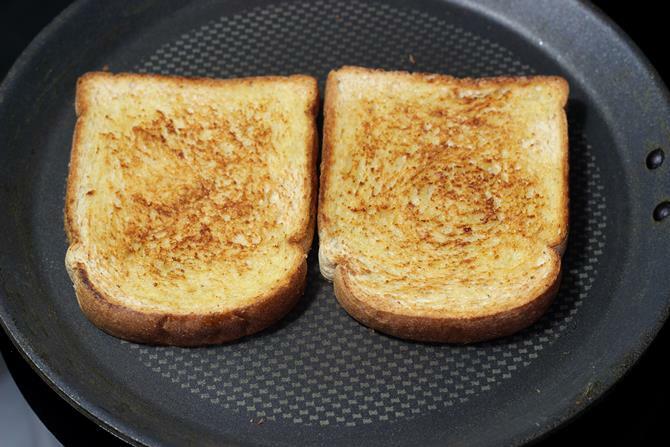 Smear butter or ghee on the bread and toast them until golden on one side and until firm on the other side. While you toast, chop or slice the veggies thinly. 2. Heat oil on a pan, Saute cumin until they crackle. Add garlic and fry until a good smell comes out. I did not have garlic so i used ginger garlic paste. 3. Add chopped, mashed or pureed tomato. 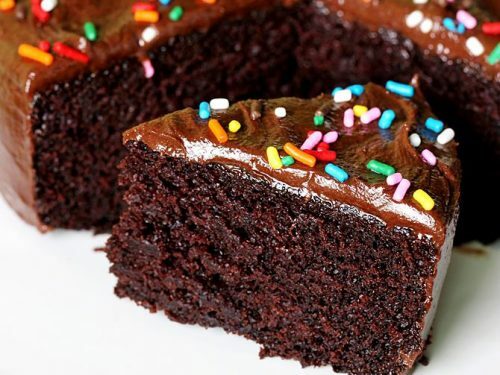 Sprinkle salt and mix. 4. Cover and cook on a medium heat until it turns completely soft and mushy. 5. You can add chilli powder now and saute for a minute. I did not use it since i used green chilies in the next step. 6. Add veggies. 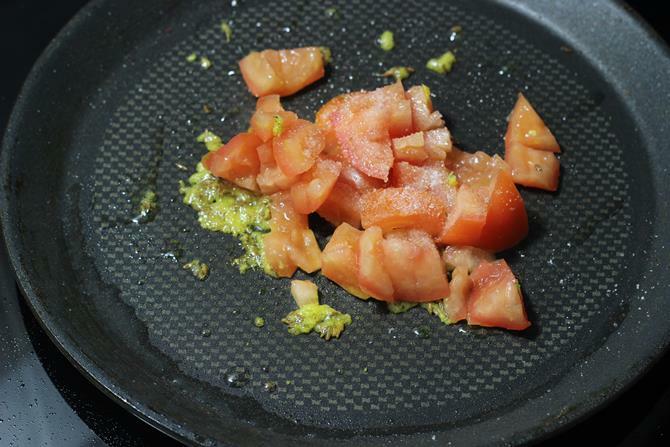 Saute on a medium to high flame until they are partially cooked. I do not cover and cook since mine gets cooked quickly. If your carrots are not tender, you may need to cover and cook. Sauteing on a high flame lends a smoky flavor. 7. Add pav bhaji masala or garam masala and coriander leaves. Pav bhaji masala works very well for this, if you do not have you can use kitchen king masala or garam masala like me. 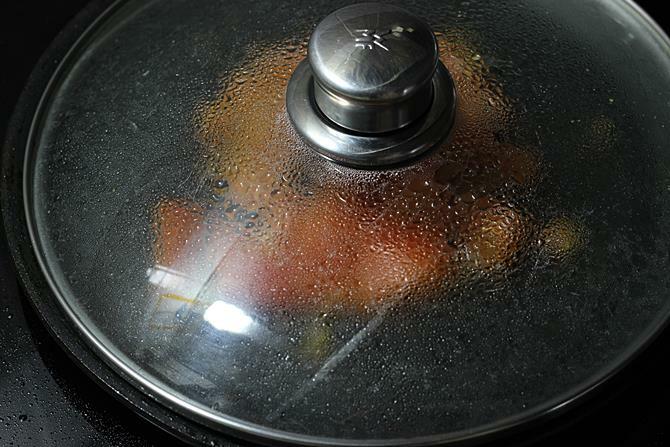 Adjust the salt and make sure the veggies are at least partially cooked. 8. Place the toasted slices and transfer the veggies over them. If you wish to have cheese , then sprinkle now. 9. Place another slice of bread. Press down gently. If using cheese, toast it on a low heat without burning until the cheese melts. Alternately you can also grill in a sandwich maker. I understand it. You must increase the flame such that the heat reaches the entire tawa. I always do 2 at a time. Hope this helps.